I’m happy to post about a new Master skin Icon Pack from artist, skinner, and all around great guy Paul Boyer aka mormegil. However, this is much more than an icon set as this is also a fundraiser to help raise money for the Leukemia and Lymphoma Society, which Paul and his wife are part of the “Team in Training” program. Stardock has joined the effort by donating all profits from this Master Skin sales to The Leukemia and Lymphoma Society to help save lives. Paul has also posted a blog about this effort, so please visit it and learn more about what they are doing for a great cause. Now this has to be the biggest Icon Pack ever created. Excellent work for a great cause Paul! Paul...Check out this LINK. Megan survived Leukemia and bone marrow transplantation, participates along with her father Jerry in "Megan's Mountain" which raises funds for the Leukemia and Lymphoma Society. I became (I hope) customer #1 for your Icon Pack in Megan's name...my contribution...a truly wonderful young woman, family and cause! This is a fantastic initiative. I'll put this on my to-buy list, can't afford it now... ... Oh, I get icons too?? A magnificent body of work for a tremedous cause. You have my support. Most of us spend more than this on a meal out on any day, this also makes you feel a lot better. without question, this is my next premium skin to purchase! I just purchased this superb pack but have a problem, in that I can only apply "Marathon Black" or "Team in Training (Purple?)". Can anyone help please ? The rest of the packs are Sub Packs. 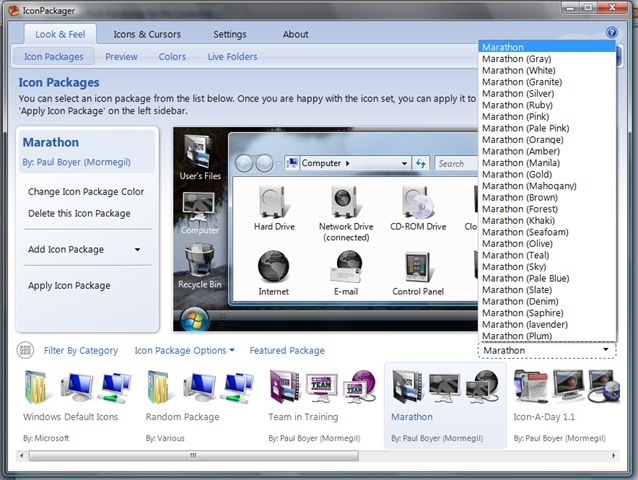 If you dont see them make sure you have the latest version of Iconpackager. But therre should be a drop down in the above the Icon list and he right. Sorry about that. I ment to mention that you should make sure you update first. Great set of Icons. Very worthy cause. I have a sugestion, Stardock is giving the 20% discount for this pack. I would have been willing to pay the full price. Maby they should remove the discount for the sale of this Icon set? HA! I never thought I would here someone request that they remove a discount. I think it would be harder to get that turned off then it would be worth the effort. If you want to give more you can go directly to our donation page, and anything you give there is tax deductable. I got my copy Paul, excellent work! this is one great icon pack, Just one thing i noticed is that the icons in the all programs menu don't change when the pack is applied, they remain windows default. But it's still well worth the money and for a good cause too. Great job, Paul. I just downloaded my icon pack. I lost my mother to Leukemia and my father to Multiple Myeloma. Every dollar helps to combat this killer. I've installed it several times but no different colors. I tried to unzip but no luck. What version of Iconpackenger are you using? and what version of windows? I have 64 bit Vista Ultimate which is the issue. I am a little upset this doesn't work but I just gave up on it.